Here’s one of my early rides on the bike, before the snow flew. I built it up with Husker Dus first, and once the first snowstorm dropped accumulation I could ride in, it became obvious that Husker Dus are not good tires in fresh powder. I ordered some Surly Nates for winter use. I also sewed up a couple pair of pogies. Those pogies turned out to be awesome below about 20F, but too warm when it was warmer than that. I did a few winter rides with just some regular long finger gloves. 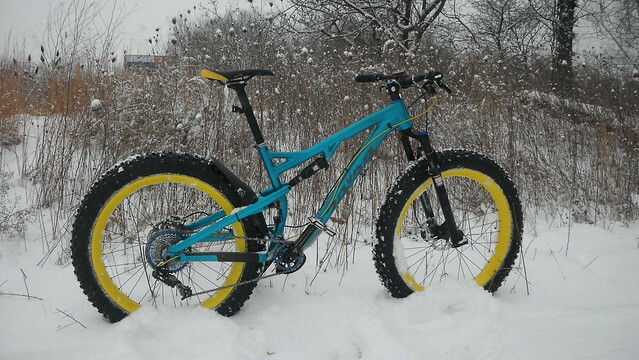 The bike does pretty well in the snow with some suitably aggressive tires. Packed snow doesn’t require big knobs, but fresh powder certainly does. I did a couple rides in fresh powder where the snow was deep enough that my feet dipped into the snow at the bottom of each pedal stroke. 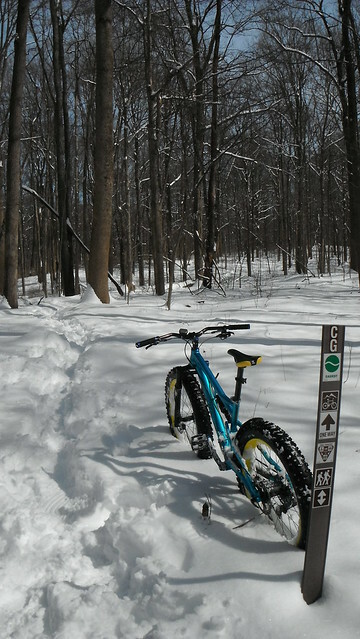 The bike motored along, even in fairly chewed up snow…so long as it was fresh. If the snow had been on the ground for awhile, and had become hard and grainy before anyone managed to pack down nice tracks, the bike had a rough time. 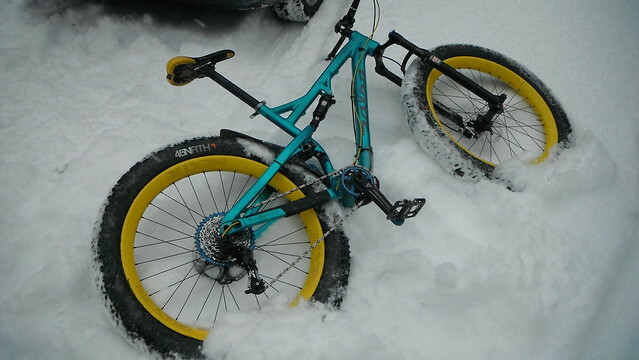 But other fatbikes had a rough time in that stuff, too. 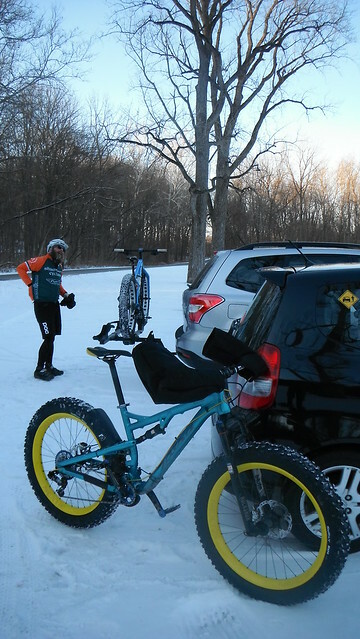 The suspension was sure nice to have when the packed snow was lumpy and uneven due to a mixture of bike, ski, snowshoe, hiker, and dog traffic. 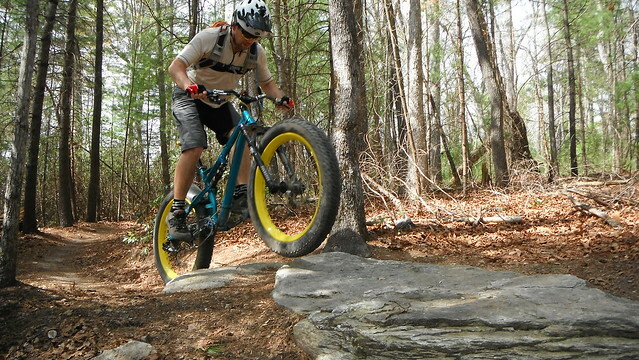 It was a nice addition beyond just having fat tires that deformed around the uneven surface. As an additional note, on dry trails, I tend to run my tire pressures at about 9psi or so. In wintertime, I would run them anywhere from around 6psi for really packed snow, to around 2psi for deep, fresh powder. Low pressures make a huge difference in fresh snow. I have my Nexties set up as tubeless. Which is a little bit of a hassle getting the tire beads to seat up, but once they’re on, they’re dead reliable. I added a Rec-Mounts stem mount for my Garmins once spring arrived. I also started pushing the speed of the bike a bit more to see how it did in situations outside of snow…which according to Salsa, it’s not really designed for. The bike itself is fast. It handles a LOT like a regular mountain bike, but with seemingly limitless traction and more chunk absorption than its 100mm of suspension travel might suggest. 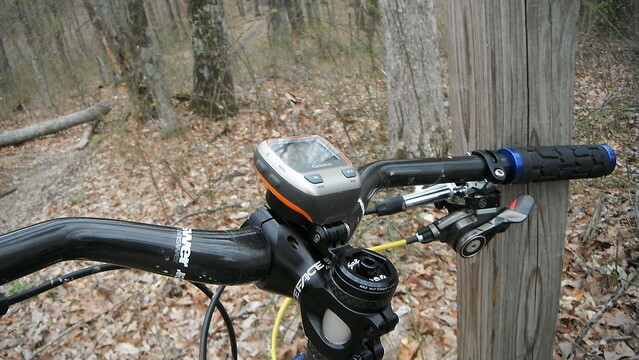 I took it to DuPont State Forest and Pisgah in April to really put it through its paces. I’ve also taken it onto Schooner Trace at Brown County State Park. The bike is great fun. My demo ride was on a mostly stock Bucksaw. My particular build is a little different, with the biggest difference being the wheels. 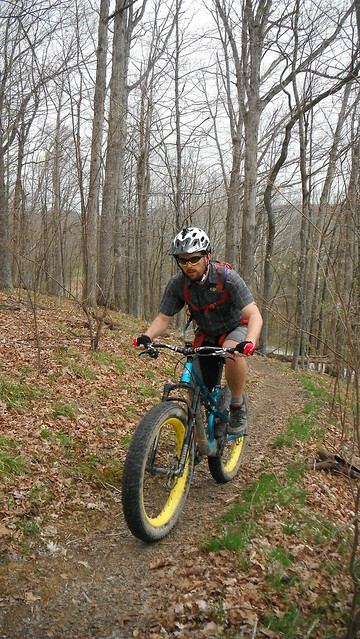 The Nextie carbon wheels don’t make the bike feel like it has an electric motor accelerating me on the downhills. They have a very neutral feeling on the bike. They still don’t quite accelerate super quickly, but I don’t really ride that way, anyway. The Bucksaw will carve if you push it into the corners. I’ve been pushing into the berms at Southwestway Park on a pretty regular basis lately. It can definitely take more than I’m throwing at it there. At this point, I’m just running into limitations with my own skill and comfort level, not with the capability of the bike. On the climbs, it does quite well. In fact, the steeper and the chunkier the climb, the better the bike does. Technical terrain is where this bike thrives. 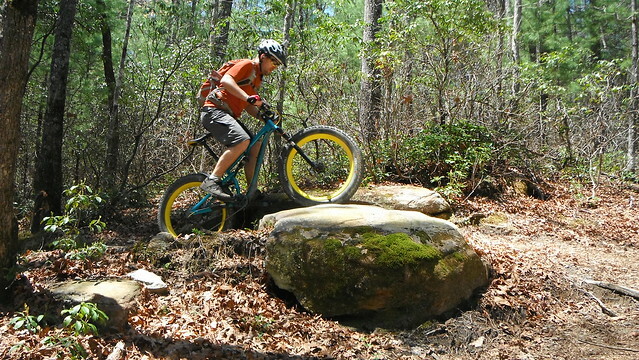 On the loose rock-strewn trails in Pisgah, the bike is sure-footed going up OR going down. It’s a little different on the slippery limestone chunk in most of Indiana. Sometimes I think that stuff requires studded tires even in summertime. It is a bit longer than my old FSR (partly due to the slackened head angle), which does make it a little trickier to handle on really tight switchbacks. I did recently swap the compression damper on the Bluto fork. I had been having some difficulty getting the settings dialed exactly how I wanted. I’d either wind up blowing through my travel, or not using nearly enough. The stock RL damper was a little tricky in that regard. Plus, the fork is a little on the sticky side, which makes it super hard to measure fork sag with any degree of accuracy. So when I swapped the damper, I also replaced all the stock grease with Slick Honey. I’m still going through the setup process with the new damper to get it dialed. But I immediately noticed that I went from 105psi in the fork down to 70psi. How much of that was due to the damper swap and how much was due to changing the grease, I’m not entirely sure. But I do feel like I need to drop the pressure a little bit more. That greatly reduced pressure does wonders for small bump compliance, I can tell that immediately. I’ll know more once I get the settings dialed better. The rear suspension pretty much disappears. I can see that it’s doing what it needs to do, and that I’m using all the travel, but I can’t feel it compressing when I ride. This is how rear suspension SHOULD work. 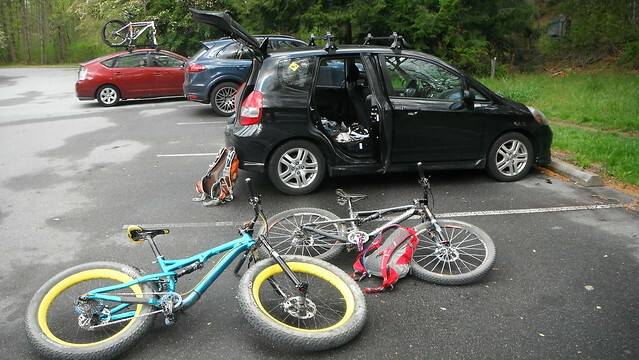 I am tempted to upgrade the rear shock to a Cane Creek DBInline, but this bike works great with the Rockshox Monarch. As for other component selections – the biggest I should probably comment on would be the Turbine CINCH crankset and RaceFace PF BB. I had some initial difficulty getting them installed. RaceFace did not include enough spindle spacers for me, and it took about 50 miles and the cranks loosening up to figure that out. Once I got the correct number of spindle spacers installed, everything went together well and the crankset has been solid. The bottom bracket has also been good. These 400mi have been a good mixture of conditions. From kinda sloppy to dry and dusty, to frozen solid, to submerging the BB in a creek crossing. The brakes have been good for this bike, also. I think 180/180 is a solid minimum rotor size for this bike. 203/180 would not be a bad choice, either, if you did a lot of sustained, technical downhills. 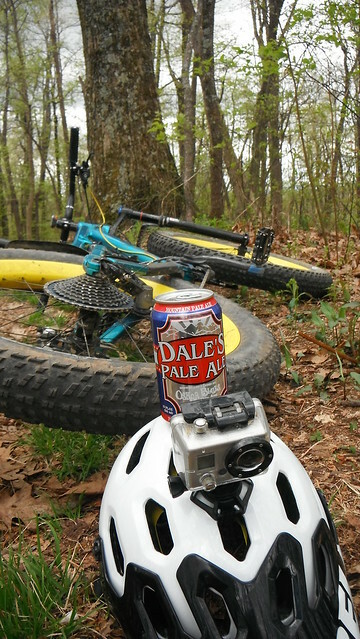 I spent a good bit of time in NC going down some chunky stuff at a pretty good clip. The brakes were sufficient for the bike, and I had no notable fade, but on a couple occasions, I felt that a 203mm front rotor may have been helpful. 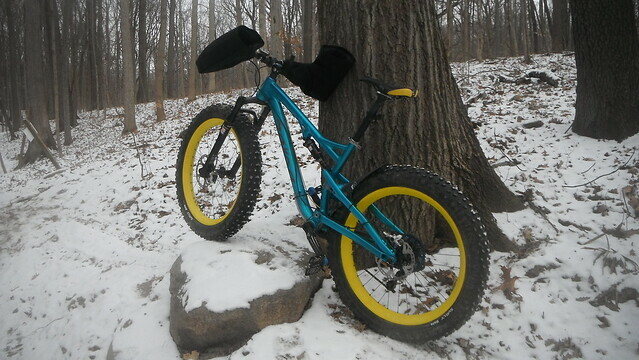 If you’ve spent a lot of time perusing fat bike forums and blogs, you’ve probably read about people blowing up their freehub bearings in fairly short order. Hope hubs are some that I’ve read about with a fair number of failures. A few things have stuck out with me in reading these discussions, after my own riding experiences, and in talking to some bike industry folks. First, I’ve got ZERO trouble whatsoever with mine. And I’ve ridden them pretty hard. Granted, I’m no clyde, but I bought the Bucksaw to ride hard. And I have. Second, in a lot of these comments you’ll read online, you get precious few details that help you pinpoint WHY there was a bearing failure. One final note – I’m chasing a ticking noise in the front end. It only happens when I’m riding through something techy, which makes it difficult to pinpoint. My next item will be to pull off the grips, clean underneath them (especially the clamps), and reinstall. I’ve already gone through the headset, the handlebar clamp, and the stem clamp. 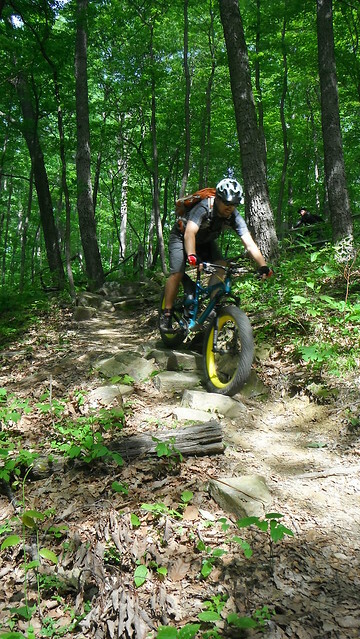 Nice report on the Bucksaw. I’m really wanting one for next year. Top notch build kit on yours. Ride on! I had a tick like that and it was the cables against the frame. I put some felt there and it’s been a quiet bike since.